The lure of the open water, even during cold weather, can be overpowering. In locales where year-round boating is possible, do not let the cold keep you from experiencing a different — and exciting — facet of boating. Extra preparation and precautions should be taken before heading out on the water when the thermometer heads downward. At no other time is it more important to take extra safety precautions than when boating in cold weather. While more boating accidents occur during warmer months, a larger number of boating fatalities occur during cold weather months because survival rates drop drastically in cold air and water temperatures. Applying some common sense can also increase your chances of survival in cold weather. Your cold weather voyage will be more safe and comfortable by following the tips below and learning the basics of hypothermia. The cold affects not only your body, but your boat as well. 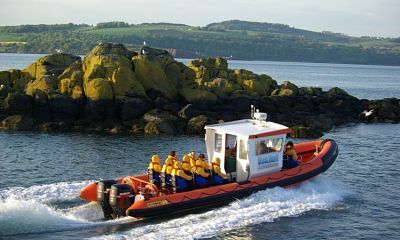 Be sure that the fuel tank is full, and the required, plus extra, safety equipment for cold weather boating is on board. Check fuel lines, steering cables, and bilge pump for ice build-up. Determine if the battery has a full charge and that isolator and terminal connections are solid. Clear standing water and ice from exposed decks, masts, antennae, and other exposed equipment. Ice build-up on the hull and equipment can critically alter the boat’s center of balance and affect maneuverability — even to the point of sinking! Carry a marine radio and use Channel 16 to call for help in emergencies. A marine radio links directly to agencies that can respond and is far better than a cell phone in emergencies because the radio signal can be traced to locate the boat in distress. Ensure that in-date signal flares, sound-producing devices (horn, bell, whistle), and other safety equipment are on board. File a float plan with a friend or family member who knows your destination and who can alert rescue agencies if your return is substantially delayed. Know how to handle your boat in heavy seas and understand the boat's limitations. Navigation lights are required to be illuminated between sunset and sunrise, and during periods of restricted visibility (rain, snow, sleet, and fog.) Activate the lights at the first sign of inclement weather. Stow oversized blankets on board in a waterproof locker or compartment. Check local weather forecasts. Remember that weather information is also available on marine radios (the “Wx” button). Keep a sharp “weather eye” and head to shore at the first indication of bad weather. § Before departing, brief passengers about cold weather and hypothermia effects. Explain what equipment is on board to assist in man overboard situations or capsizing, and how to treat hypothermia. Check all safety equipment, including marine radios, GPS devices, emergency locator beacons (if carried), and flares. Pack a First Aid kit robust enough for significant injuries and hypothermia. Have available extra food, water, and warm liquids (like coffee or hot chocolate). Dress in layers with clothing that wards off biting winds, sheds water, and traps body heat. Protect hands, feet, torso, and head from the cold and keep in mind that most body heat loss is from the head. Wear a lined hat or stocking cap to retain heat. Always wear gloves. Wear life jackets during cold weather boating, when the potential for hypothermia skyrockets. A lifejacket should never be worn under other clothing — always on top! Cold weather boaters have a greater exposure to the elements, which means a higher risk of developing hypothermia from wind-chill, capsizing, or even clothing that becomes damp while on board. Hypothermia, the accelerated heat loss from the body, can cause death. It rapidly affects the brain and creates a dangerous situation mostly because a person in cold water may not realize they are in danger. Signs of hypothermia include intense shivering, slurred speech, slow pulse, and dilated pupils. Eventually, a hypothermic person will lose consciousness and may drown. Have children or non-swimmers wear a lifejacket at all times when underway. Everyone should wear lifejackets if weather and/or sea conditions deteriorate. Stay with the boat (on top of it, if possible) if the boat capsizes or swamps. This increases the chances of being seen. Resist the urge to swim if forced into the water because it quickly saps body heat and energy. Use the Heat Escape Lessening Posture (HELP) position. Avoid alcoholic drinks, which increases blood flow and body heat to surface areas of the body, where it is quickly dissipated. Remove wet clothing immediately and dress the victim in dry clothes and apply blankets or coats. Remember that body heat from other passengers can also be used, if needed. Avoid excessive handling and do not exercise the victim. Warm the victim slowly. Never position the victim close to a heat source or use chemical warmers. If conscious, give warm drinks, but never alcohol. If trained, use Cardio Pulmonary Respiration (CPR) if the victim is not breathing. Contact the Coast Guard via marine radio Channel 16 to arrange for emergency medical personnel to meet your boat at the dock. Be ready to answer a flurry of questions about the victim’s condition. See the U.S. Coast Guard website for more information on hypothermia and cold-water survival. The cold, hard facts are that boaters need to be aware of unique situations that can occur during cold weather boating. Taking a proactive approach will help you manage them like a pro and to ensure a safe and comfortable trip for all.